1990s alt-rockers Belly are returning with their first new album in 23 years, DOVE, on May 4. The band's Tom Gorman recorded the album alongside Paul Q. Kolderie (Hole, Throwing Muses, Radiohead). Now they have shared a video for "Shiny One." 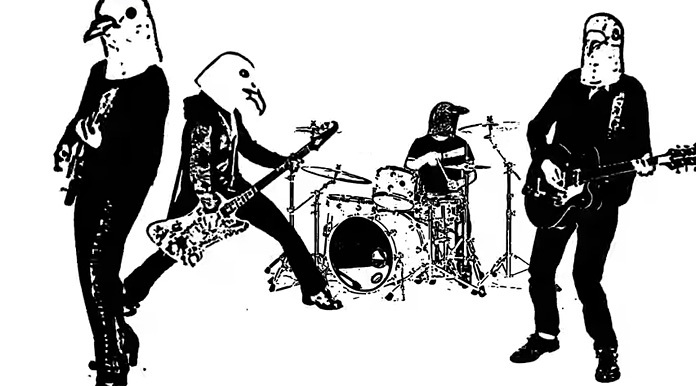 Chris Gorman and Jack McKenna directed the video, which features the band wearing bird masks. Watch it below, followed by the band's upcoming tour dates. Gorman had this to say about the video in a press release: "I purchased a crow mask from Archie McFee a few years ago for a Halloween party that had an 'enchanted forest' theme. I'm a lazy and dull human being so I just wore the mask and street clothes. In the party photos everyone looked magical and 'enchanted' but I looked disturbing and wrong. I always wanted to do something with that. "After moving to a house surrounded by woods I started capitalizing on the space for Belly stuff, like the woodshed photo shoot, or the Hushabye Mountain photo series. When it became clear that we were calling the album DOVE and the suggestion that we produce our own video the masks were my first and only idea. I sent a brief pitch to the band saying 'hey guys, what if we shoot a video and we all have bird heads?' The response was overwhelmingly affirmative. I purchased 3 more heads. "Due to scheduling I had to shoot each band member on their own - we used my garage as a studio space and the woods around my home for the 'critter in the woods' stuff and tree related b-roll. "I worked very closely with my good friend Jack McKenna as we processed the clips and together we arrived at an Andy Warhol layered silkscreen look that really seemed to match the hallucinogenic vibe and retro groove of the song. I have to give a ton of credit to Jack for pulling it all together."